At different points through Kat Candler's devastating feature "Hellion," the young Wilson brothers—10-year-old Wes (Deke Garner) and 13-year-old Jacob (Josh Higgins)—are seen reading "Swiss Family Robinson," a story about a family shipwrecked in the East Indies, who create a new home for themselves on a deserted island. Without driving the point home sledgehammer-style, the presence of "Swiss Family Robinson" is a reminder that what we are seeing in "Hellion" is also a shipwrecked family—shipwrecked by loss, alcoholism, poverty, and neglect. One of "Hellion"'s major strengths is that it shows how quickly things can spin out of control, how one or two defining events can derail a life forever. 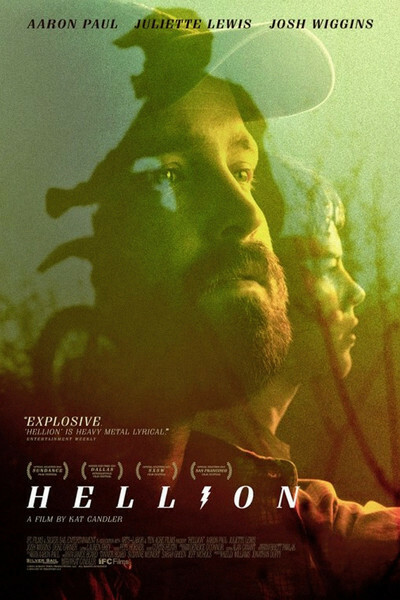 Told with much sentiment and almost no sentimentality, "Hellion" is a well-observed and patiently told story, with one good scene after another, featuring amazing performances across the board, but particularly from newcomer Josh Wiggins. The Wilson family consists of dad Hollis ("Breaking Bad"'s Aaron Paul, in yet another remarkable performance) and the two aforementioned sons. The mother has died, leaving behind an abyss in her wake, as well as her fragile dream that re-locating to Galveston will somehow give the family a fresh start. Hollis continues to invest in his dead wife's dream, driving the 40 miles to Galveston to work on their wrecked house (already in foreclosure). In the meantime, his two sons rage free, completely unmonitored. It's not that Hollis doesn't love his sons. He does. But his own grief and loss, not to mention alcoholism, has made him incapable of caring for them or himself. 13-year-old Jacob is first seen trashing a pickup truck outside a football stadium with his group of buddies he calls "the crew". Metallica and Slayer and other heavy metal monsters grind through the soundtrack, providing a violent, driving subtext to the often-melancholy scenes. Jacob is basically in charge of his younger brother, and he takes that as seriously as a 13-year-old boy can take it. But he is too young to be a caretaker; he favors Wonder Bread with whipped cream and sugar for lunch, and he has already been placed in a juvenile detention program, threatened with being locked up for the rest of his adolescence if he doesn't get his act together. Worryingly, Jacob starts to involve Wes in the criminal nighttime outings of "the crew". Hollis, taken up with his own pain, and perhaps residual guilt about descending into a drunken stupor following his wife's death, is seemingly unaware of just how bad things have gotten. His house is a total mess. Beer cans pile up on the counter. He gives Jacob a talking-to about "the crew," but still disappears for days at a time, leaving the boys unattended. His dead wife's sister, Pam (Juliette Lewis), is concerned. She tries to talk to Jacob, but there is little she can actually do. "Hellion" covers familiar ground, but it feels fresh. The film doesn't propose solutions, and it doesn't soft-pedal the fact that Hollis is dropping the ball on his responsibilities. Part of the freshness has to do with the acting, particularly of young Josh Wiggins. He is the center of the film, and he gives a full-blown, beautifully intricate and wrenching performance, completely confident in all of its aspects, not showing any whiff of amateurism. He is tender, thoughtful, pissed off, wild, and completely not dealing with how much he misses his mother. He doesn't seem like a "child actor." Or an actor at all. You wonder, "Where on earth did they find this boy?" There is a painful confrontation scene between Jacob and his father at a crowded pizza joint that is pierced through with such agony on the part of Wiggins that all you want to do is race in and save him. And when CPS shows up to take Wes out of the house, the scene that follows is terrible to witness, both children screaming and writhing around in the arms of the police officers, fighting to stay together. It's extraordinary. The friends who make up "the crew" are also insightful little character studies, a "Stand By Me" dynamic with heavy metal T-shirts and Motocross tracks. The boys all have problems at home. Adults aren't really paying attention to them. They all seem extremely vulnerable in regard to what life will have to offer them. Southeast Texas is filmed with haunting specificity by Brett Pawlak, who also shot the moving film "Short Term 12" (which takes place in a group home for kids stuck in the foster care system). Pawlak manages to make the Texas landscape look both isolated and hopeless as well as beautiful and dreamy: the towers of a nearby electrical plant looming above a local baseball field, the windswept houses-on-stilts lining the shore in Galveston, the lonely oil drills in the middle of a field. Jacob is often followed around by the camera, from room to room, or from inside to outside, his fragile small head facing out to the hostile, incomprehensible, wider world. A climactic moment in the final section of the film is handled awkwardly and ends up seeming manipulative, an imposed way to twist the screws in with finality. Suddenly, with that moment, the film becomes plot-driven, as opposed to character-driven, and it's a flaw. But, by that time, the real work of the film has already been done. The investment in the characters was so total that I found myself worrying afterwards, obsessively, "What is going to happen to those boys? Will they be okay? Is everything going to be okay?" Probably not. But the film makes you hope, against all the evidence, that it will be.